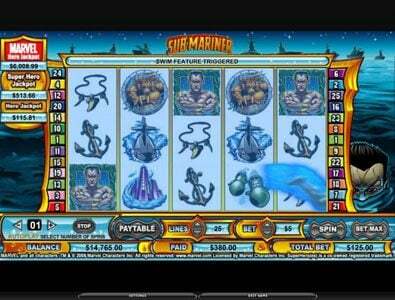 Review of Sub-Mariner online slot machine thought up by NYX software with 25 lines and 5 reels. 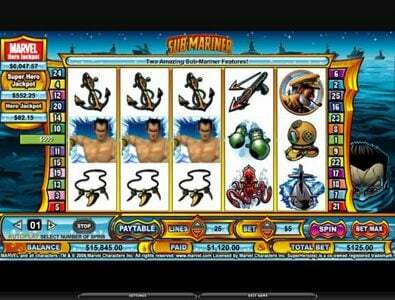 Sub-Mariner Slots has not been reviewed yet, be the first to rate this slot. 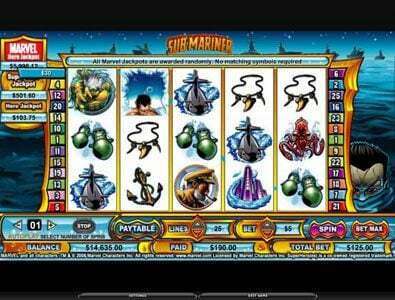 Sub-Mariner, from CryptoLogic, is a slot game with 5 reels and 25 paylines. 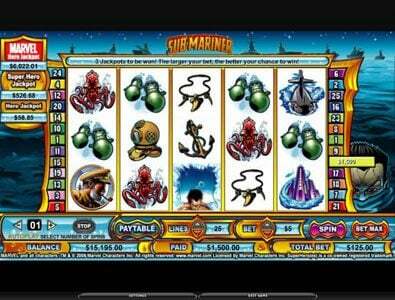 The game in question comes with Free Spins, multipliers, wild and scatter symbols. The top jackpot offered here is worth $100,000. The theme of Sub-Mariner is based on an old comic book, where a character called Sub-Mariner is a superhero whose real identity is that of Prince Namor, from the city of Atlantis. It’s not a very well known comic, since it’s been released a long time ago, but it’s definitely a good choice for a slot. The comic book inspired design with the retro graphics looks great, and you’ll have a great time playing this game, just like I did. The background image is that of the sea and the symbols are all connected with the theme. 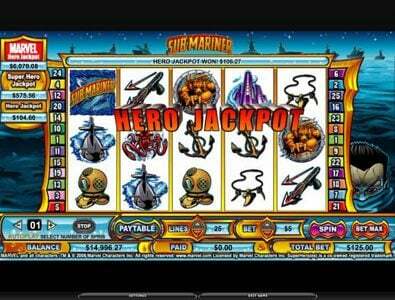 These symbols start with Sub-Mariner, and continue with the logo of the slot, with a Captain, a submarine, a skyscraper from Atlantis, a couple of underwater monsters, torpedoes, deep diver’s helmet, harpoon pistols, anchors and a tooth necklace. Each of the 25 coins used in the game activate another payline, so if you want to get the best chance to get a payout you should use all of them in your bet. The coins start at $0.01 and they can be taken up to $5. 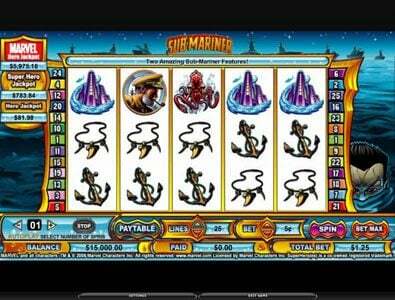 The maximum bet is worth $125, while the top jackpot of 5000 coins is worth $100,000. A big progressive jackpot is also offered by Marvel, plus two additional smaller ones. The image of Sub-Mariner will be the one that will award the 5000 coins payout of the game, if five of them are on the same line. With four symbols the payout is 1000 coins, three symbols will pay 100 coins and two symbols will pay 10. This is also the wild symbol of the slot, which means that it will substitute for all symbols, with the exception of the scattered logo. The scatter logo symbol has the benefit that there is no requirement for it to appear multiple times on the same payline. It’s enough if it shows up multiple times on the reels during the same round, in any position. The player gets a prize for 2+ symbols and access to a Bonus round with 3+ symbols of this type. The prizes go up to 100 times the round bet. Marvel’s old comics seem to be just as good as their newer titles, and you should check this one out for yourself. 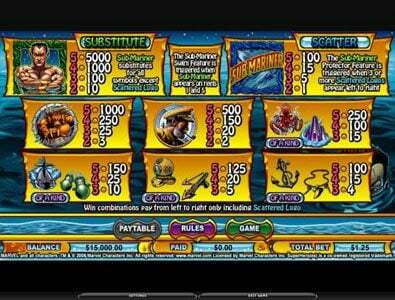 Both the payouts and the features available recommend this Slot to all players that enjoy the work of the Marvel designers.